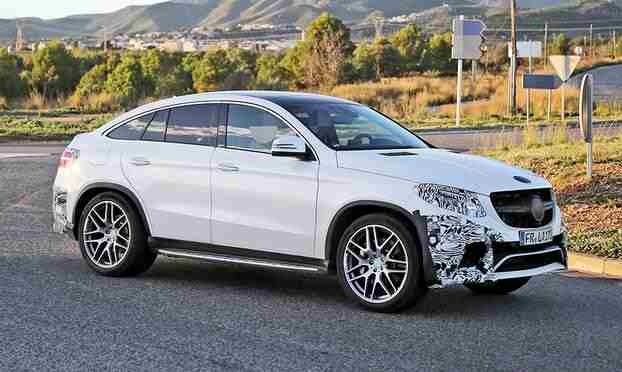 The Mercedes-Benz GLE coupe is baring more skin as days go by, which means its launching might be sooner than expected. However, several sources claimed that the mid-size sport utility vehicle will not be launched until the latter part of 2015, so we will just have to wait for further details from Mercedes and see about that. Compared to the Mercedes-Benz GLE coupe’s almost undisguised spy photos that we posted earlier, the one above has nearly stripped down its camouflage in the front bumper. This one is not much different than the latest photos we had, but it gives us a better look of what the three-pointed star brand has in store for its customers. The subject here also comes in its white-finish form, which provides us a good comparison than the other we featured previously in terms of color. The Mercedes GLE coupe originally comes from the ML-Class lineup. Like the previous M-Class models, it will be manufactured in Daimler AG’s plant in Alabama. Since it will be sold by next year, it will be sold as a 2016 year model. The SUV is hyped as the BMW X6’s rival. From the information we have fished out so far, the upcoming GLE coupe might be offered in all-wheel and rear-wheel drive versions with its power distributed via a seven-speed automatic transmission gearbox. It will probably be equipped with the same 4.0-liter twin-turbo V8 engine found in the Mercedes-AMG GT. Depending on the engine option, the output of the SUV should be somewhere between 462 hp and 510 hp.